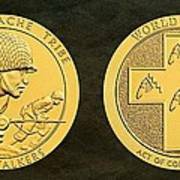 There are no comments for Tonto Apache Tribe Code Talkers Bronze Medal Art. Click here to post the first comment. 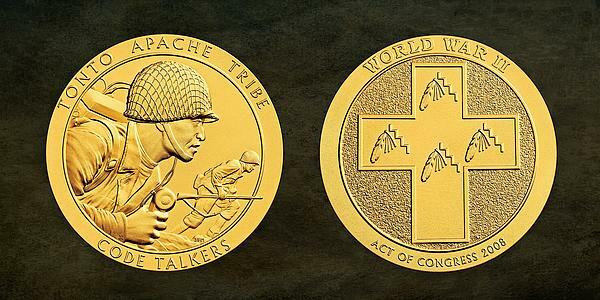 This medal is a bronze duplicate of the Congressional Gold Medal awarded to Tonto Apache Tribe Code Talkers at a ceremony at the U.S. Capitol Building on November 20, 2013,in recognition of their dedication and valor. The medal measures 3� in diameter. 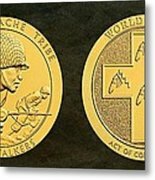 The obverse design depicts a close-up and background view of a code talker, which represents communicating a message and running a message. 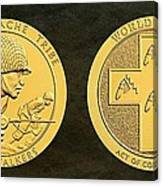 Inscriptions are TONTO APACHE TRIBE and CODE TALKERS. The reverse design features a variation of the Tonto Apache seal, which depicts four feathers, a streak of stylized lightning as depicted in Apache art and four streamers. Inscriptions are WORLD WAR I and ACT OF CONGRESS 2008.